Make sure that your planned alterations or additions abide by Auckland Council regulations and the Hobsonville Point Residents Society’s rules. Both these bodies have the same aim: to protect your investment in and enjoyment of your home. The idea is to regulate new development and make sure that existing buildings are not altered in ways that would significantly impact on neighbouring households. When everyone complies, both you and your neighbours are protected and Hobsonville Point can keep its special character. It is a unique community that has been master planned to achieve lasting high-quality urban design. When we all observe the points outlined below, everyone benefits. When you bought your home you received a certificate of title that included membership of the Hobsonville Point Residents Society and outlined its rules, which we are all expected to follow. These come on top of general obligations (shared in common with all Auckland homeowners) to comply with Auckland Council requirements. For example, there may be rules around maintaining rainwater tanks installed for water-efficient toilets, showerheads and garden taps as well as looking after fences and landscaping and the external appearance of buildings. Generally speaking, the aim is to ensure that the publicly visible facades of buildings continue to contribute to the streetscape and high-quality design standards. 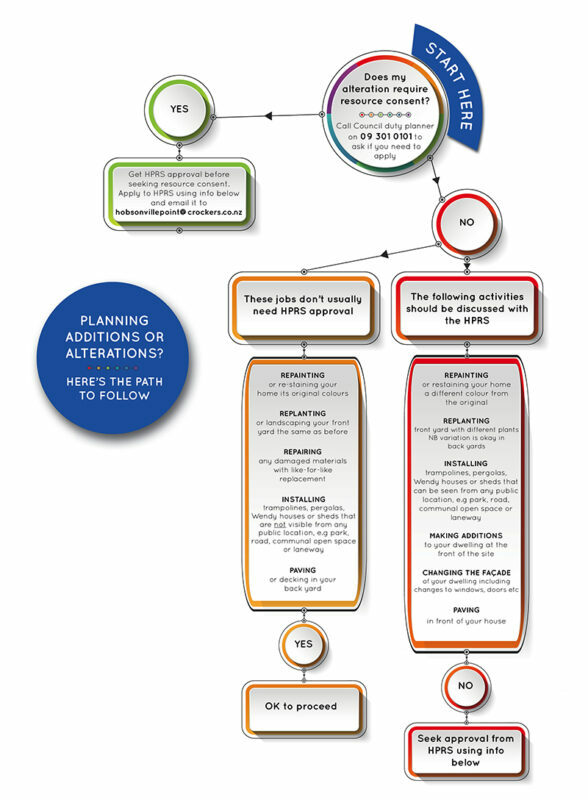 How do you check that your proposed changes will comply? Like any landowner across the city, you need to check with the Auckland Council to ensure that what you are proposing is a permitted activity. You can phone the Council’s Duty Planner on 09 301 0101 to check whether your proposal triggers the need for a Resource Consent. If what you are proposing infringes a standard in Auckland’s Unitary Plan, then you will need a Resource Consent. Undertaking an external addition or alteration to your home. Putting down additional paving on your site, or removing landscaping. Changing your existing fencing or installing a new fence. Adding a new building like a pergola, storage shed or a Wendy house. Internal alterations are generally okay, provided you are not changing external windows, but it would also pay to check whether you need a Building Consent. If your proposed work does require a Resource Consent, then it will first need to be approved by the Hobsonville Point Residents’ Society. Why? Because when you apply for Resource Consent, the process will go more smoothly if you can tell the Council that HPRS permission has already been given. For the HPRS to consider your application, the committee needs to know what you envisage – so send in details, measurements, a sketch, possibly photos. See the diagram below for guidelines. Depending on the nature and complexity of the work, you may need professional advice from a planner or architect. Even if your alteration does not need Resource Consent you must still seek approval from the HPRS because its rules and Council’s requirements are separate. Note that doing general maintenance and repairs to your Hobsonville Point home needs no Resource Consent and repainting your house in its original colour scheme is also acceptable. Also, it costs nothing to seek HPRS permission, but Resource Consent does incur fees. Any laneway society, body corporate or neighbour that may have an interest in your proposal, and whether you have discussed the project with them. A simple sketch clearly setting out and locating your alteration with dimensions. Photographs that provide context, including neighbouring properties. If you are wanting to change the external colour of your house, supply paint colour samples as well as the other info required, and let us know if your neighbours have been consulted. Identification of any adjacent streets, laneways or areas controlled by body corporates, or other resident associations. A description of your proposal (including details such as materials, colour, method of construction, etc. relevant to the Society’s rules). Note: depending on the nature and complexity of your proposal, not all of the above information is necessary. Applications should be emailed to hobsonvillepoint@crockers.co.nz and will be responded to within two weeks of being received. If necessary, further information may be sought. Note that any approval given by the HPRS does not in any way indicate approval by the Auckland Council where relevant. If you have any queries concerning your project, email hobsonvillepoint@crockers.co.nz for advice. Can I increase the height on my front fence? Generally, fencing along the street frontage or adjoining public open space cannot exceed 900mm. If you want to exceed that height, you will need a Council Resource Consent and approval of the HPRS. There are also restrictions on side and rear fencing, including fencing that faces a laneway. We recommend you check the rules with the Council. Please also note that there might be some specific front yard fencing restrictions that apply to your site as a result of the original Resource Consent granted for your dwelling. As such we strongly recommend that you talk to the Council about any changes to your front fencing. The Council will let you know what restrictions apply for your particular site. What if I want to repaint my house? You are welcome to repaint your house in the same colour it was when constructed. Colours generally form part of the resource consent for a new home and, at Hobsonville Point, it is the careful choice of aligned colour schemes across whole areas that contributes to design harmony. If you want to change your external colour scheme, then you need to have approval from the HPRS. There is a spectrum of colour schemes permitted at Hobsonville, though they differ from area to area. If you plan to repaint your house in its original colours and finishes, then go right ahead. If you want to paint your house a significantly different colour – say turquoise blue – in a street of otherwise brown homes, then you would need Resource Consent. In our view this would likely be declined by Council, and your idea would not meet with HPRS approval either. If a paint finish you want is at all different from the original colour scheme, then you need to approach HPRS with details of your proposal. See section above: ‘How to Apply to the HPRS Committee’. Supply paint samples as well as the other info required and let us know if your neighbours have been consulted. Even a subtle colour change on one wall can stand out markedly alongside adjacent walls, so we need to consider each request carefully. Can I place a shed at the front of my house? You will need to check with the Auckland Council first in terms of the yard and building coverage rules. Generally, the HPRS seeks to avoid new buildings in front of your home though you may be able to put such structures in your back yard (you still need to check the rules with the Auckland Council). Can I change the plants and landscaping on my section? We encourage you to maintain the existing landscaping on your site, particularly in the front yard. The design guideline for your area includes lists of suitable species that are encouraged in Hobsonville Point. If you want to replace your front landscaping with something different from the originally approved design, you need to have approval from the HPRS. Please check with the Council about the removal of any grass areas, including replacement with astro turf or stone/chip/impermeable surface. Can I install solar panels on my home? It’s best to locate any solar panels to the rear of your building to avoid them being visible from the streetscape. Or, if possible, from any shared communal area. Can I install an outdoor pizza oven or brazier? Auckland Council allows barbecues, braziers and pizza ovens in urban areas, providing they comply with info you can find here. Given that our area is full of high-density housing, the Society encourages people to be respectful of neighbours’ requests re undue smoke or cooking smells – but also acknowledges that outdoor cooking is part of the New Zealand way of life, especially in summer. Can I install heating and cooling equipment (heat pumps)? We support owners installing heating and cooling equipment, but the external equipment must not be visible from the street (i.e it should go in the rear yard or be appropriately screened). Special attention needs to be given to the location of conduits and piping to eliminate adverse visual impact. Installing external equipment to roofs generally is not acceptable. What are the Hobsonville Design Guidelines? The Design Guidelines control architectural and development quality, including front yard landscaping and fencing. They provide a degree of certainty to the ‘look and feel’ of Hobsonville Point, while also encouraging variety and interest within the buildings and landscape. Copies of these documents can be found in the Publications section at www.hobsonvillepoint.co.nz (look under Planning at lower-right side of the Publications page). What is the difference between Resource Consent and Building Consent? Resource Consent: A planning process embedded into the Resource Management Act (RMA) that requires all development proposals to be submitted to the relevant local authority, unless exempted as a permitted activity. The approval is deemed Resource Consent. All development in Hobsonville Point is subject to a Resource Consent application from the Auckland Council, submitted by the land owner or their agent. Building Consent: This relates to the approval of buildings and structures in terms of the NZ Building Act to ensure that work meets the requirement of the Building Code. Many of the properties at the Point have cedar exterior panels or walls. The cedar feature is a great look as part of the overall colour scheme for your home and the surrounding area as part of the overall design for your particular neighbourhood. 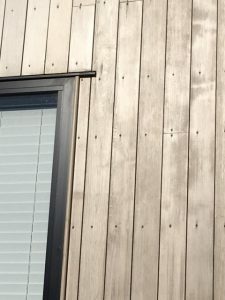 Cedar is a different product to conventional weatherboards and requires an extra level of care to keep it looking good and in good condition. If you have cedar on your home it is important that you don’t ignore the maintenance required. Here is a brief summary of what you need to consider. Unlike conventional painted surfaces, cedar requires recoating every two to three years. This helps to maintain its original lustre and protects the wood from premature deterioration. In addition to recoating, cedar (and indeed your whole house) should be washed annually with a suitable house wash process and then rinsed off. There are many commercial operators who can advise you on this but it’s best to use a “soft wash” approach as cedar is a soft wood that is easily damaged. Washing stained (and painted) surfaces helps remove contaminants that eventually eat into the coating. Once that damage is done the preparation work required increases considerably. Also look out for mould spotting. This generally occurs when the cedar has become exposed through lack of maintenance and in this case you will need to treat the mould spores. Talk to your house washer about this. Generally, if you wash annually and recoat every two to three years you will be able to apply a new coat of stain without having to sand the cedar back. Leave it longer than that and sanding preparation will be necessary, which is time consuming and expensive. The first step is to check your property folder to see what product was applied when it was built. If you are unsure, your builder should be able to provide that information. It is best to stick to the same product for recoating. And note that recoating requires two coats to get the right coverage. Recoating a multilevel home can be a difficult task. To ensure the job is done correctly and safely, you will need to look at some form of scaffolding. This is not cheap so it is worth chatting to your neighbours to see if there can be any savings made from doing a group deal with a scaffolding company. Once the scaffolding is in place you should be able to tackle the job yourself if you feel confident and energetic enough. If not, leave it to the experts. Find a commercial painter who has had experience with cedar. In summary, don’t ignore your cedar. Look after it within the guidleines detailed here and it will continue to look beautiful! Hobsonville Point is a rapidly growing community in North-West Auckland. It is a friendly, welcoming and inclusive community – the kind of place where you know your neighbours and the next community event is never far away.